bluefish: Although contacted repeatedly, Don Brunell has yet to provide evidence that lower Snake River dams provide flood control benefits. Unlike many Columiba River dams, the Lower Snake River dams were not designed to be flood control dams nor did Congress authorize them as such. The U.S. is being inundated with historic floods from Minnesota to Louisiana as a massive amount of water from heavy rainfall and snowmelt races down the Mississippi River. With U.S. taxpayers shouldering the majority of the claims through the National Flood Insurance Program, Bloomberg reports the Mississippi's surge could result in the highest flooding losses since the $16 billion in claims following Hurricane Katrina. Without our network of dams on the lower Columbia and Snake rivers, we'd be in the same fix. On May 30, 1948, a levee on the flood-swollen Columbia River ruptured and within a few hours a 10-foot high wall of water reduced Vanport, now North Portland, to a shattered, muddy ruin. Sixteen people died and Vanport -- at the time, Oregon's second largest city -- disappeared forever. President Harry Truman flew west to see the water-logged mess. Speaking to an audience in Portland, Truman said the flooding could have been averted if a network of dams along the Columbia, Snake and Willamette rivers was in place. He scolded Congress and told them to get off the dime and fund the Bureau of Reclamation to complete its flood control projects. 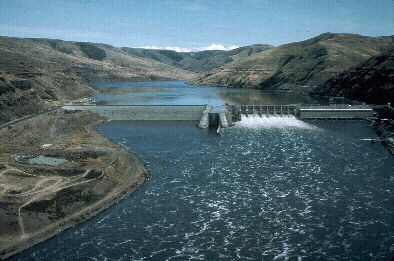 Over the next 20 years, the McNary, Dalles and John Day dams were completed on the lower Columbia and Ice Harbor, Lower Monumental, Little Goose and Lower Granite dams were completed on the lower Snake, adding flood control capacity, generating much-needed hydropower and establishing a 465-mile water transportation network from the Pacific Ocean to Clarkston. That network of "flood busters" is saving our bacon this year. With snowpack in the Cascades and Rockies running up to twice normal, rivers in western Canada and the Pacific Northwest from the Tetons in Wyoming west to Astoria are quickly filling reservoirs. In Montana, as the undammed Yellowstone River roars out of Yellowstone National Park, the state Department of Transportation closed a 20-mile stretch of the eastbound lanes of Interstate 90 -- Montana's main east-west thoroughfare -- from Livingston to Springdale as water flooded over the roadway. The same thing happened in Washington a few years ago when torrential rains clobbered Lewis, Thurston and Grays Harbor counties in early December. The flooding from the free-flowing Chehalis River and its tributaries inundated the Centralia area closing I-5 and stopping north-south rail service for a week. Even with our flood control dams, this spring we're seeing longer traffic delays on the I-5 bridge over the Columbia between Vancouver and Portland because boats that normally pass under the bridge now require the draw span to open. Nevertheless, Washington and Oregon should be spared the floods that are devastating the Midwest and South. Grand Coulee, the anchor dam in our flood control system, is currently drawn down so it can absorb the flood waters coming from Montana, Idaho and British Columbia. That will regulate the river flows for agriculture, salmon and steelhead migration, barging, electricity and recreation. Those who want to remove the dams from the lower Columbia and Snake rivers don't talk about how those dams prevent widespread devastation. But we should all remember that without those flood busters, we'd be in a world of hurt.